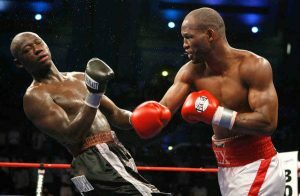 Ring News 24Boxing History Boxing News Breaking Boxing NewsBernard Hopkins Claims Retirement On Saturday: 5 Of His Defining Fights Reviewed! 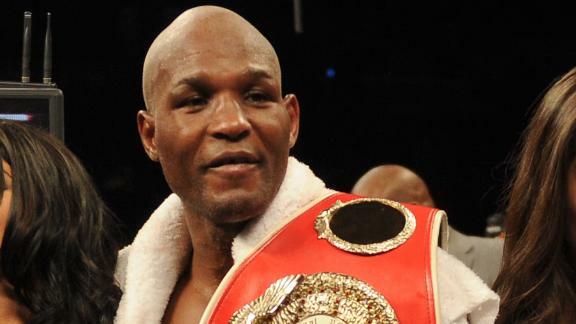 Bernard Hopkins is set to call it a day after Saturday night when he takes on once beaten Joe Smith Jr at the Forum in Inglewood, California. Smith Jr has a record of 22-1 with 18 KO’s, a record that is not too shabby. The 51 year old multi time champion stated that he aims to “give a performance where people are begging me to stay.” Hopkins has made an incredible 20 defences of the IBF middleweight title, including against names such as Oscar De La Hoya, William Joppy and Felix Trinidad. Now 51 years of age, it is difficult to see where the Philadelphian fighter could go should he wish to carry on which is why now is the right time to let the next generation of boxers take over. This editorial is going to take a look at 5 defining fights in Bernard Hopkins’ career including, and from his grand win over Trinidad. Little was taken notice of The Executioner up until his career defining fight against Felix Trinidad in 2001. The build up was quite heated, with Hopkins making Trinidad livid after slinging the Puerto Rican flag to the ground at a press conference. Whether the mind games affected Trinidad is anybody’s guess, although he looked relaxed and came out dancing to the ring wearing a wide smile. But that big grin would be wiped off his face roughly 34 minutes later when Trinidad found himself on the seat of his shorts in the final round after taking a huge right hook to the head. He got up on shaky legs but his trainer stepped in to call the fight off when there was no doubt that further punishment would have inevitably rained down on him. Hopkins was widely ahead on all three official scorecards in a contest and performance that got the world to give him the respect that he yearned for so many years. 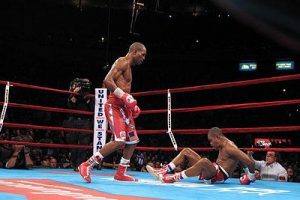 Jermain Taylor was crushed by Pavlik inside 7 rounds in their thrilling title bout leading to beliefs that Bernard Hopkins would suffer the same fate, and maybe even a loss of quality to his life! Evander Holyfield had heard all that before back in 1996 before facing Mike Tyson, something he took little notice before going ahead and destroying him. 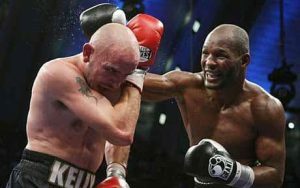 Although it never resulted in a knockout, Bernard Hopkins schooled Pavlik over 12 rounds, giving him a shellacking in some of them and there was no doubt who was the winner at the end. Hopkins even eyed up press row as soon as the final bell sounded, his glare telling even the most experienced of journalists that they cannot predict everything! Tavoris Cloud had built up a reputation for being quite a fearsome puncher after going 24-0 with 19 KO’s. 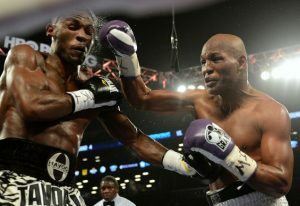 But the fearless Bernard Hopkins showed who was boss when he won a wide unanimous decision, ending yet another impressive unbeaten record . Cloud would lose his next two fights, both by stoppage, perhaps hinting that his loss to Hopkins did more psychological damage than it first appeared. Kelly Pavlik could, no doubt, relate! Antonio Tarver had caused quite a after beating Roy Jones Jr twice, leading to the ‘Magic Man’ to claim that he was the “Legend Killer”. But Hopkins was going to prove that beating Roy Jones Jr was all that was going to be his claim to fame by outclassing Tarver for all of 12 rounds, even staggering him in the fifth. The tag “The Legend Killer” was certainly dispelled! The Golden Boy was to take on his toughest challenge yet despite winning a controversial contest against German Felix Sturm in his fight previously, hinting that perhaps the middleweight division was maybe a class too far for him. But De La Hoya was known for taking on all comers and wasn’t going to turn down the opportunity to fight to be the undisputed middleweight boxer. 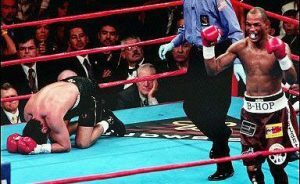 Unfortunately for him, Hopkins would deliver the first stoppage of De La Hoya’s career with a body shot that was claimed to have hit him right “on the button” in the 9th round to prove that ruling the middleweight division wasn’t in his destiny. The six weight champion would move down a weight to have multi-million dollar fights with Floyd Mayweather and Manny Pacquiao that would also go against him in the final act of his career.